life on the raggedy edge. By So Here's Us.... life on the raggedy edge. 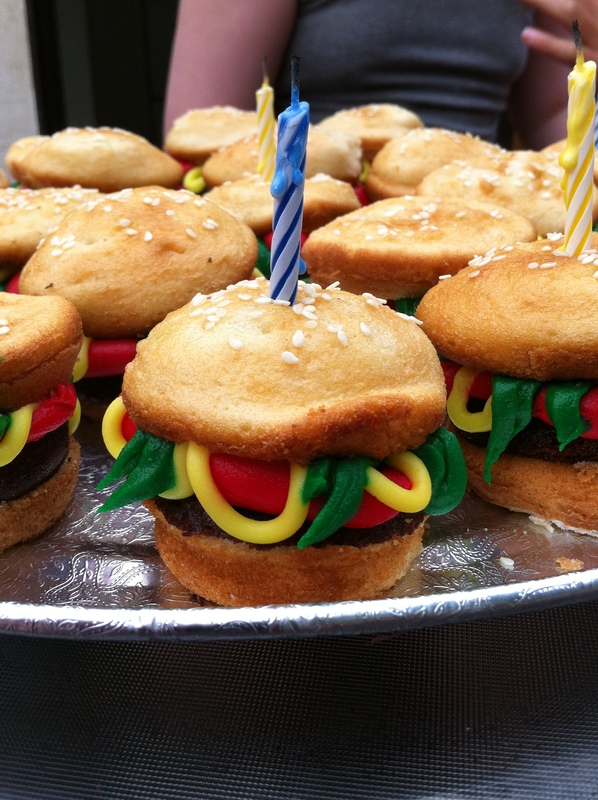 These AMAZING hamburger cupcakes were courtesy of Aunt Erin… the birthday girl loved them! Today is an important day. The big one-O. Now that you have that first decade under your belt, we can see more clearly the kind of human being you are becoming.That is not to say that any of this is written in stone. You can certainly change your path along the way. After all, you love to be unpredictable. But I hope you don’t, because you are shaping up to be a pretty cool person. Possibly cooler than me… a fact you vehemently remind me of, quite often. If eye rolling were an Olympic sport, we’d be cashing endorsement cheques right now. Do me a favour and cut me some slack now and then. I bet when you are 36 you will look back and realize I wasn’t quite as lame as you thought. 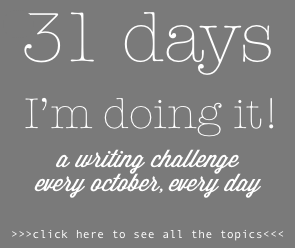 And I’ll let you in on a little secret: it’s kind of fun to push your buttons. If you didn’t protest quite so loudly, I wouldn’t have to sing/dance/act like an idiot quite as enthusiastically. Embarrassing our kids, well, it’s sort of a family tradition. I have a feeling you will one day do it also. With gusto. You are passionate. This will be both a blessing and a curse. I speak from experience. Passionate seems a lot like emotionally volatile sometimes. So watch the temper. It isn’t wrong to feel angry, but it can give birth to all sorts of wrong (and stupid) reactions. That’s been my experience all too often. Don’t be your own worst enemy. Take a breath. Use your head and not your heart before you speak. Passionate can be a lot of work. BUT, worth it, because: You love fiercely. You laugh with abandon. You take risks. Passionate is an important ingredient for greatness. You are a leader. I remember when you were a toddler and you would boss your older sister around. I had to tell that almost 4-year-old not to let her baby sister bully her or push her around. You know your own mind and are not afraid to share it. I know it doesn’t always seem like this is something we appreciate. But we do. Strength of will is something to be admired, but used wisely. Pick your battles. If you are always contrary, then people (and by people, I mean your Dad and I) will stop listening to you. Save your strength for the issues that really matter. The best way to win, is to win people over. You have the wit and intelligence to do it. You are unique. Yesterday at your birthday party, you played volleyball with a fish (whom you named Bob). You waded in a pool full of blue jello. You threw balloons full of milk at your dad. You had a whipped cream fight with your friends. Instead of a cake, you had hamburger cupcakes. Because you don’t want just a regular old birthday party. You love to be different. The world is more interesting when you are around. I think anyone else would be lost in the shuffle as the middle child in our family, especially with another special needs sibling in the mix. But it is impossible to overlook you. You were designed to stand out. With teenage-dom already breathing down our necks, you’ve begun to follow the fashions and trends of the friends around you. Which is fine. As long as you don’t lose that one-of-a-kind flare that is all you. Don’t be afraid to be silly. Or weird. Or different. You can totally pull it off. You are loved. It seems like you and I go head to head more often than any one else in the family. Both of us are emotionally volatile passionate people. This year, I promise to try to be more patient and to listen better. I’d like it if you could do the same. Because, life is better when we’re friends. But first and foremost, I’m your mom. So we won’t always be pals. And that’s okay. It might even be necessary. But no matter what happens, I want you to know that I am passionate about how much I love you. And how important you are to me. And what a gift you are to the world. I think you are an amazing person. I’m pretty sure you always know that I love you (on some level), but I think you should know that I like you a whole lot too. You are one of my favourite people in the world! I’m not a perfect mom. And you aren’t a perfect kid. But I think we’re a perfect match. I’m so glad that God made you a part of my family. I can’t imagine my life without you. Happy 10th birthday, and welcome to the double digits! What a year it has been for our family – a year of change, which is not your favourite thing. For three years, we talked about adoption. We renovated our house to make room, and we dreamed about what kind of child would join our family. All along the way, there was one girl in our family who wasn’t so sure that this was a great idea. She worried about what the changes would mean. Would the new kid fit in? Would she like him? Would he wreck her room and mess up her stuff? Would there be enough time/attention/money to go around? Weren’t we too busy already? In case you haven’t already figured it out, that girl was you. And, truth be told, you had a much more realistic view of the situation than your big sister did. You knew that there were going to be major changes, and that it was going to take a lot of hard work, sacrifice and patience to bring a whole new person into the family. You were right. I’ll admit, I was worried: what if C hates adoption? What if she resents him – or what if she resents us for making this decision? But here’s the thing: I have never admired you more than I have in the past three months. As we’ve gone on this new adventure together, I have seen the wonderful, accepting, loving, giving young lady that you are becoming. It all started when you helped paint his room. From that moment on, C was on board the adoption train. I saw that you loved S the first day we met him, and that’s when I knew everything was going to be okay. The feeling was clearly mutual, as a few weeks later it was you who caused him to laugh harder and more hilariously than I’ve ever heard a child laugh. Since then, you have patiently endured every change. You’ve given up things that you wanted to do, to play with him and keep him entertained – and you’ve done it without complaining. You’ve come back to him again and again after every time that he’s accidentally hurt you – and that’s happened a lot. Last night you spotted him on the couch looking at a book, and you said, “I’m going to take advantage of this opportunity,” and scooped him right up onto your lap for a cuddle. I am so unbelievably proud of you. I tell everyone that I don’t know how we possibly could have survived the chaos of the past three months without C and L. You have been incredibly helpful, and surpassed all my expectations for how you would handle this. Thank you. I love you. And I will carry you to bed for as many years as you’ll let me. About So Here's Us.... life on the raggedy edge. I'm a bookworm, nature lover, kick-boxer, candy fiend, sci fi geek, home body, progressive Christian and part-time student. I love my crazy life and the messy, fun, stubborn, silly, brilliant people who populate it. View all posts by So Here's Us.... life on the raggedy edge. This entry was posted on Monday, August 20th, 2012 at 7:00 am	and tagged with birthday, birthday letters, daughter, Mother-daughter and posted in parenting. You can follow any responses to this entry through the RSS 2.0 feed. These are the words that buzz around in my head until I let them out. It should be obvious, and it certainly is enshrined in law regardless, but every picture and word on this blog (unless otherwise indicated) is the sole property of the author.